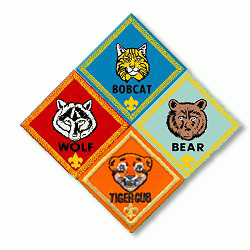 HI This really doesn't have to do with insignia, but rather awarding the BOBCAT badge to a new Cub Scout. I know we are no longer allowed to hold the boy upside down in order to pin it on his uniform. Our pack still has the parent pin the badge on the boys' shirt upside down (Without turning the boy), and then when he completes his good deed, he may sew the badge on right side up. However, last night at our pack meeting, when we were about to have the mom pin the badge on the boys' shirt, (upside down), another parent yelled out, "you can't do that anymore". His reason being is the Cub Scout don't "Do a good turn daily"--he was saying that is a BOY scout saying.. He is right about the saying, but shouldn't we teach our cubs to do a good turn daily? And are we allowed to pin the badge on upside-down? The parent is right but you can still place the pin onto the uniform upside-down. The National Director of Cub Scouting wrote (and there's a copy of his correspondence on the USSSP's website under "upside-down Bobcat"; if you can't find it, let me know and I'll see if I can find a direct URL to it!) to the field that ""Do A Good Turn Daily" is the Boy Scout's motto, not that of the Cub Scout program, and that we should not use it because it confuses both Scouts and parents." The Cub Scout motto of course, is "Do Your Best" and that's what we should be encouraging our Cub Scouts to do. So, when you pin the Bobcat Badge pin onto a new Cub Scout, you should encourage them to "do something of service to someone because Cub Scouts "...Gives good will"; when this is done, you or your parents should turn the Bobcat Badge pin upside-right. This should solve the parents' concern that you're doing "something illegal" and your Pack's tradition of pinning the Badge upside-down until the first time a new Cub Scout understands that service to others is a part of what Cub Scouting is all about. The only policy change, Carole, is that which I'm sure your Council's Executive is aware of...that is being of turning Cub Scouts upside-down to pin or attach anything to their uniforms. The pinning wasn't the issue and still is not the issue; the way it was being done and the reasoning thereof was. If you tie it to the Cub Scout Law of the Pack and in particular that part of the Law which states that Cub Scouts are expected to provide service to others, then you shouldn't have a problem with anyone. Hope I've helped and thanks for stopping by my site as well as in asking the question...I'll post this to the Leaders' Online (tm) site and also forward a copy to the USSSP for posting onto their site as well, because it's getting to "that time of the year..."